The Kirkwood Ski Resort is one of the seven Lake Tahoe ski areas. Lake Tahoe is situated in the Sierra/Nevada mountain range, on the California/Nevada border. The area has the largest concentration of ski resorts in North America. The area is named after the 12 miles wide and 22 miles long Lake Tahoe, which can be seen from various points on the mountain. 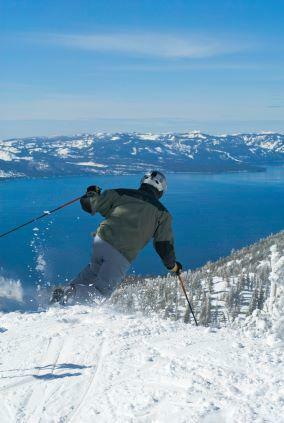 The Kirkwood Ski Resort is located in South Lake Tahoe, whose ambiance is distinctly different from North Lake Tahoe. South Lake Tahoe has an abundance of high-rise casinos, motels, and shopping malls and cheap lodging venues. As such, it's an ideal destination if you are traveling with non-skiers who prefer night lift to slope time. In 1863, a man by the name of Jack Kirkwood established a dairy along the Carson Emigrant Trail. The trail was used primarily by pioneers traveling from the eastern to the western part of the country. With the official formation of Alpine County, Kirkwood's barn and dairy became the Old Time Resort, which was a popular summer destination for local families. Years later, in 1966, Zack Kirkwood's descendants sold the area to Kirkwood Meadows Inc. Then, in 1972, the Kirkwood Ski Resort opened. The resort boasts a base elevation of 7,800 feet. Its summit is at 9,8000 feet. These impressive numbers make it the highest resort in Lake Tahoe as well as the first peak to catch the snow during a snowstorm. Kirkwood is blessed with an average annual snowfall of 500 inches. The resort has 2,300 skiable acres, 65 trails, 12 lifts which include two high speed quads and top to bottom snow making capabilities on four of its runs. Although opening and closing dates are weather-dependent, Kirkwood usually stays open for 162 days a year. Kirkwood is not the best resort for novice skiers and snowboarders. In fact, only 15 percent of its terrain is marked green, or suitable for beginners. In contrast, 20 percent is marked advanced or black, 15 percent is expert or double black and 50 percent is marked blue or intermediate. Its four fully-equipped terrain parks make Kirkwood a freestyle skiing and snowboarding paradise. The Adventure Land Beginner Park is located off chair 9. This is the perfect park for children and terrain park novices. The park offers an ample variety of features, which include rollers, spines, and whoop-de-doos. The Rip Curl Playground is the newest addition to Kirkwood's family of terrain parks. This intermediate park is located off of Chair 7 at Timber Creek. It offers an excellent variety of jumps and boxes as well as a halfpipe. Expert freestyle skiers and snowboarders can show off their skills at the Stomping Grounds. Located off of chair 5, this area is home to a challenging selection of jumps and rails. Kirkwood's permanent Skier/Boarder X Course is located off chair 5. It serves as host to a number of boarder X competitions. The Kirkwood Resort is home to Beacon Basin, which is California's first avalanche transceiver training facility. During the winter season, on the first Sunday of each month, Kirkwood lift ticket holders can participate in a free, 90-minute transceiver clinic. The ski school also offers backcountry awareness clinics, avalanche training and snowcat tours. In addition to its alpine resort, Kirkwood also has a 7,800 foot cross-country ski and snowshoe center, which boasts 80 kilometers of groomed trails. It is located 35 miles south of the Kirkwood alpine resort.